Our UltraPES™ Polyethersufone (PES) hollow-fiber membrane provides a retentive layer on the inner side of the hollow-fiber membrane. It exhibits an extremely hydrophilic characteristic which reduces the potential of fouling. In addition UltraPES™ shows a high caustic resistance and free chlorine tolerance allowing Liqui-Flux® modules to operate at pH values between 1 and 13. Membrana's PES membranes are known for their well defined pore structure. UltraPES™ demonstrates this with its distinctive three layer structure providing a highly porous support for the separation layer giving mechanical strength through thicker polymer ligaments and a protection layer on the outside with reduced pore-size to safeguard the overall membrane structure and integrity. The pronounced asymmetric structure leads to an outstanding relation of permeability and retention rate. 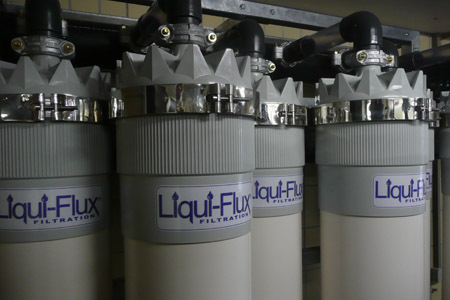 This allows UltraPES™ to achieve high volume flow at low transmembrane pressure and provides a unique way to reduce energy costs resulting in low operating costs particularly for larger filtration plants. Membrana’s UltraPES™ membrane is stabilized by its Multifiber P.E.T.® Technology. 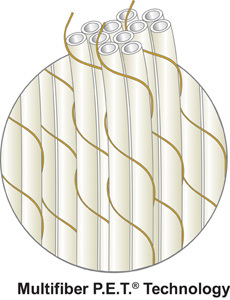 Groups of hollow fiber membranes are interlaced with a robust PET yarn, which is potted together with the membranes. This provides additional mechanical strength for the hollow-fiber in the axial direction as well as during backflushing when the fibers can experience some flexing . At the same time hydrodynamics during the back wash is improved as the yarn acts as spacer between small bundles of hollow fiber membranes. This ensures better access for the flushing water to reach all areas of the membrane sections even in the central area of a membrane segment.